Sept. 7, 2012 – I read each page of the mostly redacted 221 pages of the files that the FBI released to Seth Rosenfeld on the subject of Richard Aoki (and many multiple names with varying versions of first, middle and surnames, including the supposed code name Richard Ford). The only thing that I believe can be confirmed by these heavily redacted files is that the FBI believed it had an informant. The files begin in the early 1960s and go to the fall of 1977. No files seem to exist after 1977, so any allegation or intimation of on-going contact with the FBI is non-existent. Let’s for the sake of argument assume that the FBI “had their man” (as Rosenfeld concludes) in one Richard Aoki. In their vetting of Aoki, they do a background check including the possibility that Aoki might even be a “plant,” the FBI word for an infiltrator into the FBI! There is no conclusion or methodology revealed as to how they vetted that question of Aoki possibly being such a “plant.” We read page after page of repetitive bureaucratic corroboration that Aoki is indeed a quality informant. In many areas, the heading of “Information furnished of Unusual Value” are all blanks, most of the time not very large in size – a couple of lines, sometimes a paragraph in size. The only thing that I believe can be confirmed by these heavily redacted files is that the FBI believed it had an informant. Ah! Now we get juicier: Reading the below, one might surmise that there was some doubt about “the informant’s” usefulness. Whoa! What’s this? Either “the informant” or his/her handler in the FBI was not doing a very good job, so much so that a higher up (initialed RLR) had to write a strongly-worded admonition. We repeatedly get “Steps taken to advance informant” with [blanks]. Clearly, the FBI wants to know about “those individuals and organizations” who are “against the interests of the U.S.,” which, at the time, were many! Quite a big job for one guy. It seems like the FBI didn’t learn much from the informant about the “activities directed against the interests of the U.S.” in Asian American studies. Perhaps FBI agents should have enrolled and taken classes. They’d have at least learned something about Asian American oppression and struggle! What’s the value of “the informant” to the FBI at this time? In memo date 9/30/70 [Aoki-221] we get the statement: “The informant has the ability to relate to all races and crosses the barriers between the ethnic movements with ease.” The FBI seems clueless that this “ability” is being used to organize and catalyze a nation-wide movement to transform the entire curricula of American higher education: viz., ethnic, women’s, GLBT and other “area” studies. If we knew the nature of that information and to whom or what the “whereabouts” referred to, we could have possibly evaluated if the “informant” had contributed anything of value to the state. Subsequent memos indicate no resolution of this seemingly high-value target, so we have no idea if “source” proved to be useful in any way. And there you have it. As the Black Panther Party had capitulated to reformism, and the U.S. Marxist-Leninist movement was on the rise – former ‘60s radicals becoming harder-core revolutionaries – and as the informant was making a career, the FBI concludes that the informant can be trusted to be “let go,” even without the perfunctory retirement Rolex. Here is where the timid scholars who’ve responded to Rosenfeld can’t engage: the political realm. 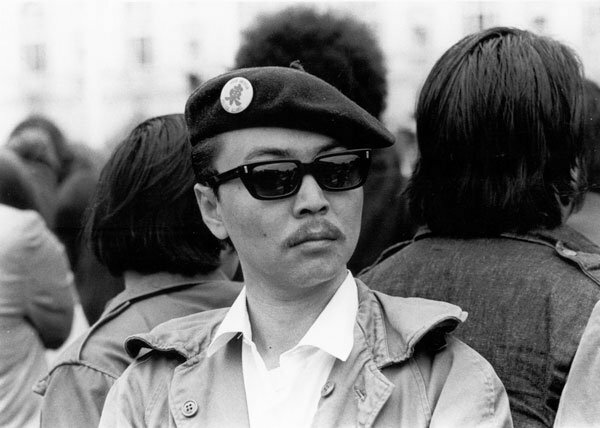 I have argued before that should that informant be Richard Aoki, then his contributions to social change – elevating the ideological engagement of radicals, both then and to the end of his life; the leadership in establishing ethnic studies; his return to activism in the 1990s to fire a new generation of radicals; etc. – should be the primary evaluation to challenge and disavow these allegations. Richard Aoki did not serve the U.S. Empire. He did not foment division, dissent, disruption and debilitation but the opposite: He provided revolutionary leadership, inspiration, discipline, training and was exemplary. To impugn the legacy of Richard Aoki is precisely to play into the hands of the enemy. Aoki did no harm; not one shred of credible evidence can be put forward. Rather, his legacy remains unassailable. Richard Aoki was a great revolutionary, whose brilliance, dedication, commitment and discipline inspired and directly contributed to the development of so many, including myself. I can’t credit the FBI for this! And here’s something folks need to really understand, and the best way to express it is by sarcasm: FBI DOCUMENTS ARE STERLING EXAMPLES OF TRUTH, ACCURACY AND WELL-MEANING INTENTIONS! Indeed, we just need to look at the examples, from Cointelpro to Waco! To rely upon them to discredit someone like Richard Aoki can only be done by providing the amplification of huge press attention given to documents that tell nothing incriminating whatsoever. If these FBI documents are Rosenfeld’s proof unassailable, then why not cite them in any of the footnotes in his book? Why are they ONLY NOW coming to public light? If one wants to entertain motives, were these documents fed to Rosenfeld only recently with the blowback he’s faced? Through these FBI memos, the informant is painted as someone in a state of impecuniosity – trying to get enough money to get a car, to make his tuition, to just get by. If the supposition that Rosenfeld puts forward that Aoki was paid the then-going rate of a FBI informant, about $2,900 a month in today’s equivalency, for 16 years, that’d amount to quite a bit of bread: more than half a million dollars in today’s value. Clearly, we can see by all accounts, Aoki never lived large, never really had any dough. And assuming Richard was that “informant,” how did that money pay back the FBI and the U.S. Empire? 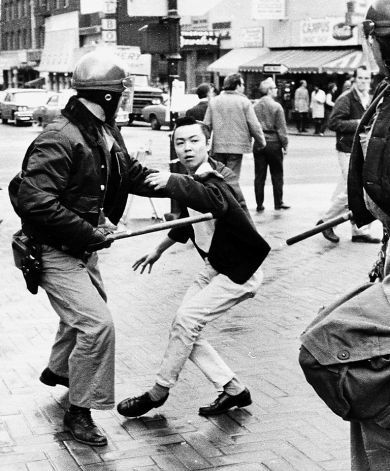 We’ve answered the tired and stupid inference that Aoki’s initial arming of the Black Panthers may have contributed to the escalation of armed confrontations, but seriously, anyone of serious expertise has pointed out two incontrovertible points: possession of firearms was legal in California at that time – hence the Panthers’ clever use of firearms in their police patrols and storming the state capitol; and not only the Panthers, but all radical groups of that era, were well on a trajectory built upon the momentum of Malcolm X, Robert F. Williams, the Deacons of Defense, Geronimo, Crazy Horse, Tecumseh … a long history of military resistance to the European invasion of this continent and the expansion of U.S. Empire. Richard Aoki has been used as a sensationalized hook to sell Rosenfeld’s book. The recently released FBI documents still don’t pass the burden of proof and only fuel more speculation as to Rosenfeld’s motives. If you’ve had them, why release them after the criticisms and challenges to your book have erupted? 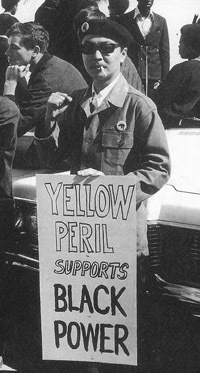 The FBI’s sordid snitch-baiting (probably the most murderous example was the fomenting of conflict between the Los Angeles chapter of the Black Panther Party with the US – United Slaves – organization of Maulana Ron Karenga, which resulted in deaths) can’t be denied or even dismissed as Rosenfeld seems to do. If these FBI documents are Rosenfeld’s proof unassailable, then why not cite them in any of the footnotes in his book? Why are they ONLY NOW coming to public light? The transparency of the allegations towards Richard Aoki – deceased since 2009 – the day before Farrar Straus Giroux published Rosenfeld’s book is equally odious and suspicious. Furthermore, I raise the political challenge to these allegations, even if true, that they only serve to fuel “doubt on so many levels to building radical politics, sowing dissension between Black nationalists and Asian American radicals, distrust of our revolutionary leaders of past and present, fear for the police-state and its power to extend itself into the core leadership of revolutionary movements,” and as witnessed by the liberal capitulation to the reformist politics of non-violence, to elevate non-violence and discredit and cast anti-revolutionary and pro-electoralist-reformist aspersions against Black Liberationists. Furthermore, “this is simply the tip of an iceberg building to stave off the growth of radicalism generated by the Occupy, eco-socialist and anti-globalization movements both in the U.S. and across the planet” (quoted from “Fred Ho refutes the claim that Richard Aoki was an FBI informant,” Aug. 21, 2012). And lastly, let me playfully assert a hypothetical argument, something that Rosenfeld can’t seem to have the revolutionary imagination to grasp: that the FBI suspicion that Aoki was a “plant” might actually be the case! That for 16 years, the genius and trickster Aoki continued to lead on the FBI. That Richard Aoki was handling THEM! All of us who knew and respected Richard believe that he was more than capable of engaging in this type of “snake-eating” (counter-counter insurgency). The legacy and contributions of Richard Aoki are uncontestable, unassailable, eminently verifiable and profoundly multiplicative. Fred Ho is described by Wikipedia as “an American jazz baritone saxophonist, composer, bandleader, playwright, writer and social activist … many of (whose) works fuse the melodies of indigenous and traditional Asian and African musics, which as Ho would say is the music of the majority of the world’s people. He has also co-edited two books: ‘Legacy to Liberation: Politics and Culture of Revolutionary Asian Pacific America’ and ‘Sounding Off! Music as Subversion/ Resistance/ Revolution.’ He has a third book in progress about African Americans and Asians working together in civil rights, which he is co-writing with Purdue University professor of African American studies Bill Mullen.” The Bay View thanks Freedom Archives for providing this story. There are probably more informants in the Asian American movement in which Fred Ho is involved–this is just the tip of the iceberg! FBI field offices were required to submit quarterly reports to HQ to evaluate the information received from its informants. Typically, field offices expressed informant reliability in percentage terms, such as by a statemnt that "information found to be 95% accurate" OR a field office might state that "informant is of unknown reliability". So Ward Churchill's attempt to euphemize and de-value what FBI files show about Aoki is quite disingenuous because FBI Special Agents never just "thought" they had an informant; they were required to routinely evaluate whatever information they received from probationary informants in order to conclude that it was, in fact, accurate and reliable. Ward Churchill is a very biased analyst. Whenever he has the option of choosing a positive, or negative, or a neutral observation or conclusion about the FBI, he always (without exception) chooses the most negative option or adverse interpretation possible. Similarly, one can see the same pattern with respect to how Churchill describes Seth Rosenfeld. Churchill prefers to use ad hominem slurs against Seth. Seth has spent 30 years of research on his subject matter but Churchill is perfectly comfortable writing extremely derogatory judgments about someone he does not know anything about within 30 seconds. Ideologues like Ward Churchill never research, discover, and then reveal anything which is inconvenient to their own political preferences. If, by accident, Churchill stumbled across documentation which reflected adversely upon Aoki — we can be certain that Churchill would suppress it. More specialist still are some weekly newspapers, usually free and distributed within limited areas these may serve communities as specific as certain immigrant populations, or the local gay community. Please let me know if you’re looking for a writer for your blog. You have some really good articles and I think I would be a good asset. If you ever want to take some of the load off, I’d really like to write some material for your blog in exchange for a link back to mine. Please shoot me an email if interested. Many thanks!